Have you noticed that Robb's back in the cool kids' section, over there -->? Welcome back, Robb--so happy to see you. Combine flour and sugar; set aside. Melt chocolate with butter, then add to dry mixture. Stir in eggs, nuts and vanilla. Fill paper-lined muffin cups 2/3 full. Bake at 300 degrees for 35 to 40 minutes. The recipe made 18. I left out the nuts and substituted chocolate chips, partly because I think lots of people don't like nuts in their muffins, but mostly because I'm down to my last cup or so of walnuts and I didn't want to share (I see a walnut run to Fleet Farm in my near future). I also substituted margarine for the butter because I didn't have any butter, and generally I like the taste of margarine in baked goods better than butter (I know, sacrilege). And I used 2 oz of chocolate, because that's all I had*, plus 6 T baking cocoa and 2 T shortening. I was a little concerned about the lack of leavening, but they turned out OK. I started out by saying that I don't like chocolate muffins, and that is true. The chocolate muffins that I've had in the past are too big and too, I don't know, not really slimy, but you know how sometimes store-bought muffins are too moist and a bit tasteless?...These muffins surprised me--I actually liked them! They were not too sweet, and the tops were just a little bit crunchy/chewy, if those two adjectives even make sense together. Speaking of buying unsweetened baking chocolate, did you know you can buy that stuff on Amazon.com ? You can get practically anything on Amazon. Of course, if it took me almost 12 years to use 8 ounces, I really don't know what I'd do with 2 pounds of the stuff. Last week I finally got around to doing one of the things I wanted to do before Christmas but never got to: I made clothes for the magnetic paper dolls that I gave Bubby and the Camp Scarlet girls for Christmas (yes, those poor babies have been naked for well over a month now--at least they've got lots of hair styles to choose from). I got the idea after seeing magnetic dress-up dolls like these at Target. It's really easy, and they're so cute! I used the dolls found over at a fun, free website: Making Friends. First, I chose and printed bodies and hair on magnetic inkjet paper and cut them out using ordinary scissors. Next, I chose clothing for the dolls, using the themes provided at Making Friends, printed them on magnetic paper (I bought mine on amazon.com , but office supply stores carry it as well), and cut them out. A couple of my favorites are the tiedye and denim themes, but there are so many cute themes to choose from--too many, I think (I only bought 20 sheets of paper!). They even have Bible people that you can make, as well as a Nativity set, that I may make next Christmas. Each of the children was given a metal tin in which to keep their dolls and accessories, but Bubby (and Logo, but don't tell him I told you) have been playing with ours on the metal face of our dishwasher. So much fun! If you don't want to invest in magnetic paper, but would like to have some paper dolls to play with, you could easily print the templates on paper. I would for sure print the bodies on a heavier paper like cardstock, or glue them to cardboard before cutting out, and I would probably reinforce them with clear contact paper (which you can find near the shelf-liners at Target or Walmart), or clear packing tape. And remember to leave tabs on the clothing when you cut it out so you'll have something to help keep the clothes on. 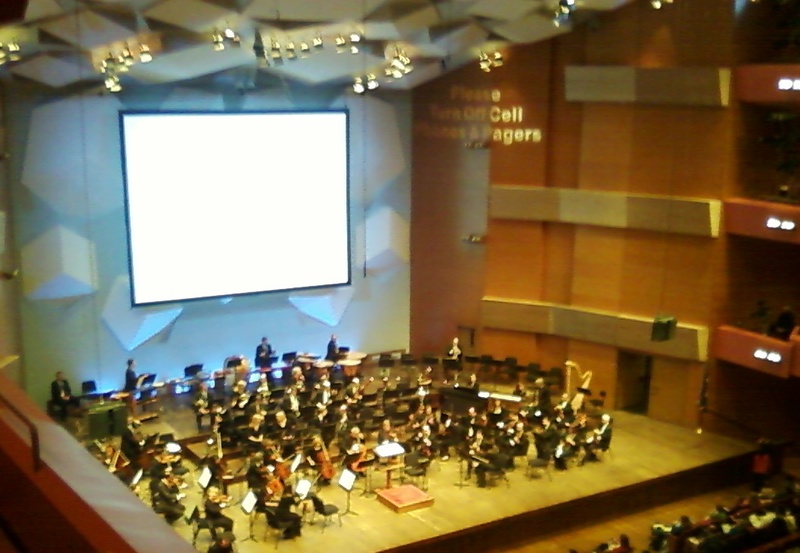 Today we attended the Minnesota Orchestra's performance of "Musical Tales," part of the Target Free Family Concert Series. I apologize for the poor quality of the pics--cell phone, no flash. 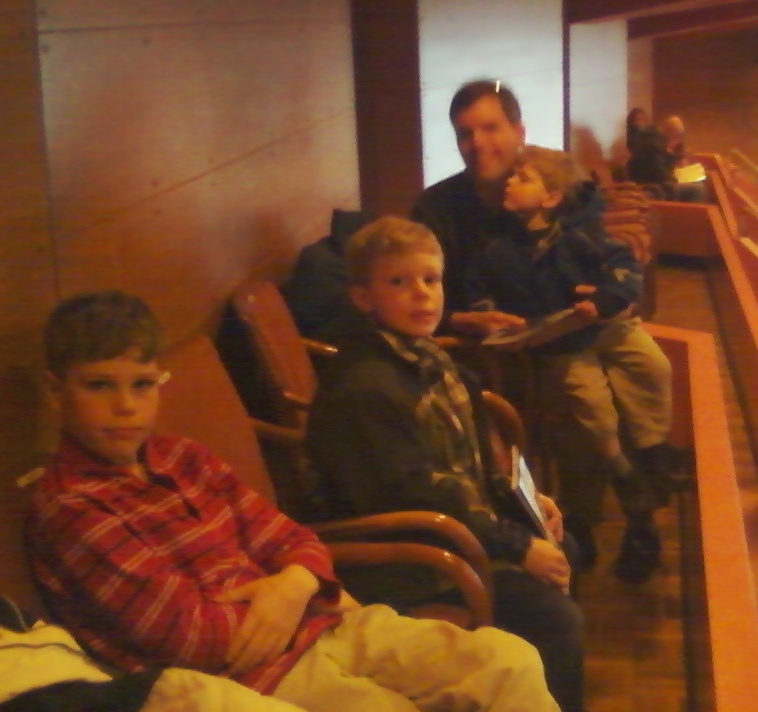 We've found our seats and are waiting for the musicians to begin. My favorite piece was "Tubby the Tuba," based on the book by Paul Tripp. The orchestra told the story of Tubby, who was tired of always playing oompahs and never getting to play melodies, through word and music. Very cute story, and I love how the instruments and the narrator told the story together. Another of my favorites was "The Sorcerer's Apprentice," which you may remember from Disney's Fantasia. Again, the instruments told the story so beautifully. The piece was accompanied by drawings made by school children who had seen the show earlier in the week. 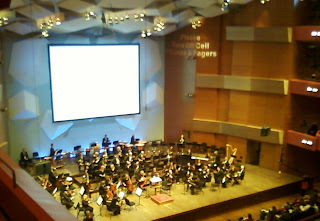 The drawings were projected on the screen above and behind the orchestra. When I asked the boys if they enjoyed the concert, they all replied enthusiastically in the affirmative, and I know I enjoyed the experience. It was a lovely way to spend an afternoon together, and I was thankful for the opportunity. Bubby got this inflatable tube thingy for Christmas and we finally got around to inflating it today. So much fun! I got it last year on clearance, and when Christmas-time rolled around, I wasn't so sure that Bubby would like it, but I needn't have worried: he loved it! Bubby rolled in it. Rufus rolled in it. Bubby and Rufus rolled in it. Bubby made me roll in it. We stood it on end and played peek-a-boo... Please note Bubby's hair standing on end. You may be wondering why this tube thingy is upstairs in the living room, when generally we keep things like this downstairs in the family room where there are fewer breakables to knock over. Funny story. No way was I going to be able to remain conscious long enough to blow the thing up myself, so I decided to use the air compressor. The air compressor is in the garage. Not wanting Hubby to necessarily know that I had used it (he's a bit possessive of his tools sometimes), and in any case, not being sure how to safely transport it anywhere else, I decided to use the compressor in place. But since I didn't want the tube thingy to get dirty, I snaked the compressor hose over to the mud room to blow it up there. I had a brief thought that maybe once we got it blown up we wouldn't be able to get it through the door, out of the mud room, but decided that it would probably fit (have I ever mentioned that my spacial analysis skills leave something to be desired?). before events conspired to make us set them aside. First we had Camp Scarlet, then Pal's mom's school was canceled, so Pal stayed home with mom, then our school district had an inservice day so Pal's dad stayed home with Pal and her sisters, and now today Bubby is sick, so Pal went over to her aunt's house instead of hanging out with us. Once again, the best Hubby in the world cut 7" lengths of 2x4 for us, and I painted them white, then applied masking tape in sort of a T pattern. The kids painted them black, leaving the masked neck and belly areas white. This morning I got tired of waiting for Pal (have I mentioned that I hate clutter? These 2x4s have been sitting on our fire place for weeks), so I started gathering supplies to finish one of the penguins, at least. I was surprised and pleased when Bubby told me that he wanted to help. We got smart this time, and put the hat and scarf on first. They're both made out of an orphan sock--I think I need to start buying brighter socks so that when I lose one of them, the remaining one makes a fun hat or scarf or whatever it is we need, but this blue one is cute enough, right? We decided googly eyes would look best, after considering other materials like buttons, sequins, and pom poms, and we used a fun foam triangle for the beak. Bubby got a little glue happy...have I mentioned how wonderful tacky glue is for kid's craft projects? It's thicker and stickier than regular school glue. We use Aleene's Original Tacky Glue . The snowflake confetti was Bubby's artistic decision, I think because he wanted an excuse to use more glue after all of the other parts were in place. And here's our penguin hanging out with his friend the snowman. As you can see, the glue isn't even dry yet, but I was too excited to show this to you to wait. After I pried the glue bottle out of Bubby's hands, we read a couple of books about penguins, including Tacky the Penguin by Helen Lester (speaking of tacky...), a cute book about being yourself, even if your self is different, and Animal Safari - Penguins . And that's the story of our moring creating our new penguin friend. It is on days like today that I am most thankful that I am able to stay home with my children. Today, Bubby is not feeling well, and since I have nothing more pressing on my agenda than folding the ever-multiplying laundry, and washing the never-ending dirty dishes, I can afford the luxury of snuggling with my little feverish Patoot for however long he wants me to: all day long, if necessary. I'm not happy that my poor baby is sick, not by a long shot, but it does bring me a sense of contentment to be able to care for him when he needs me so intensely. I finally managed to get him to take some tylenol, so he's feeling sightly better now than he was when I snapped this picture. You may have noticed a new button over there --> that says, "Blogging for Books." I'm pretty excited about the opportunity to receive free copies of books from WaterBrook Multnomah, a Christian book publisher, in return for posting reviews. I mean, really, what could be better than free books? For my first book, I chose God Loves Me More Than That by Dandi Daley Mackall. Look for my review in a couple of weeks! We spent Saturday at the MALL, including a visit to Underwater Adventures (yes, we parked in the ramp; no I wasn't driving). Just as an aside, I really do not understand why anyone would want to spend time at the MALL, or any mall, just for fun. The MALL is not fun. One of the main attractions is the jellyfish exhibit. I could have watched them for hours. Here's the "Underwater" part: we got to walk through (the moving walkway was closed for renovations) a huge plexiglas tunnel, with fishies swimming around us. Bubby enjoyed the turtles. Code-man and Logo seemed impressed by the sharks. I was looking for rays. Very fun. No visit to the MALL is complete without a visit to the Lego Store. This transformer dude is made completely of legos. Oh, and by the way, he's about 20 feet tall. That's a lot of legos. I love that at the Lego Store, you can buy bricks in bulk. You can design your own lego set, or replace pieces that you've lost to the roving vacuum cleaner. On Sunday, of course we watched the Packers pound the Bears into the turf. You know, I've got to say, Packers fans are the most enthusiastic and loyal fans in the NFL. I'm not exactly sure why that's the case, but those Packers fans are especially attached to their team. People are getting pretty excited around here. Hubby and Patoot watching the Steelers defeat the Jets. Not really sure what's going on here. Code-man was supposed to be folding laundry. Well folks, I got the opportunity to try making tortillas sooner than I thought--I had forgotten that we were scheduled to have tacos for supper tonight and we were plumb out of store-bought tortillas. I found several recipes in an online search, and chose one from Cooks.com to try, since it seemed to be the simplest, and I already had all of the ingredients on hand (about half of the recipes I found call for lard, which is just not a staple in our household). Combine all the flour, salt, vegetable oil, and water until it forms a dough. Roll the dough into a big ball and take about an 1 to 2 inch pieces off. Pat the dough flat with your hands or take a rolling pin and roll into circles. Put the dough on a flat pan on the stove and let the sides cook until there are little brown specks on both sides like you would see on other tortillas. I think I may want to try one of the recipes that calls for baking powder to see how they compare, and I'm going to need to make a whole lot more of them, I think. I had been hoping to be able to stock up the freezer so that I don't have to make tortillas every time we have tacos, but there were only 5 left over for me to freeze. All in all, a worthwhile experiment. Just in case you've ever wondered if it is less expensive to make your own bread than it is to buy it pre-made (you know who you are), here's my bread cost breakdown. Before I get to that, though, let me say that if I walk into the store and buy these ingredients, in the sizes available in most grocery stores, for the specific purpose of making 2 loaves of bread, and only those 2 loaves of bread, then obviously that would be much more expensive than just buying 2 loaves of bread. I already have all of these items on hand, so one could argue that the marginal cost of my 2 loaves of bread is $0. But, I'm sure that's not what y'all are looking for, so here you go. FYI, these are not extreme couponing prices--these are what you could reasonably expect to pay for these items, just walking into the store. When I buy bread, I buy the el-cheapo store brand, which sells for $1.65 a loaf in my area. If I wanted to buy bread that is of the same quality as my homemade bread, I would expect to pay around $3.59, so yes, I would say that making bread is cheaper, even if I take my energy usage into account. Just in case you were wondering, my next project is to make flour tortillas. All they have in them is flour, water, fat, and leavening. By making my own, I will not only save money, but I will also be able to add whole wheat flour and/or flax, or whatever else strikes my fancy, to make them tasty and healthy. Yum! 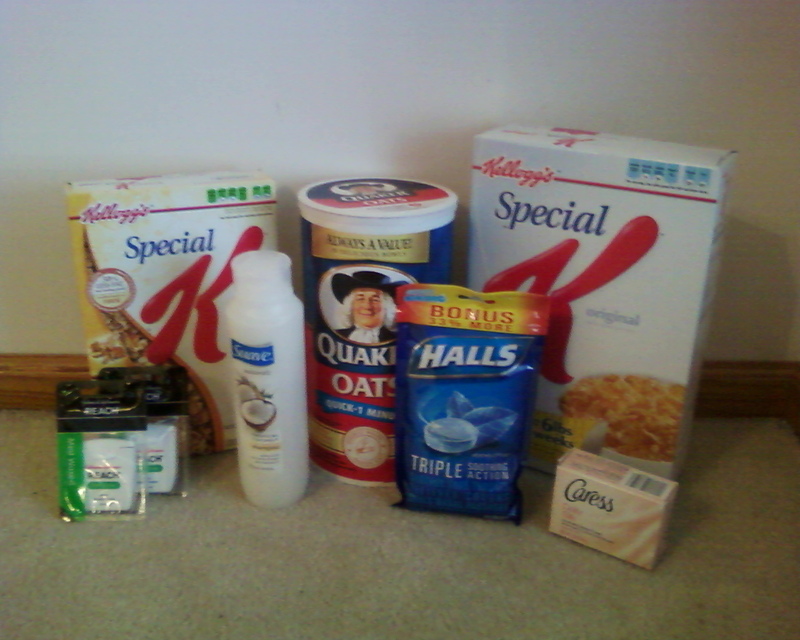 I got all of these items for free using coupons or by requesting free samples. There are well over $50 worth of personal care necessities in this pile, not including the value of the free samples, and I'm not done yet. Next month, I will be donating these items and more to Project Home, which provides emergency shelter to families in our area who find themselves without a place to stay. Now, if I wasn't couponing, I would definitely go out and buy some travel-sized items to donate to the project, but certainly, it would not be $50+ worth. Being able to care for some of our community's most vulnerable citizens' needs in such a practical way is even more thrilling, more satisfying, than scoring a box of oatmeal for free, or even cutting my grocery budget in half. This, my friends, is why I coupon. And here's another fun little project that we did at Camp Scarlet today (FYI, when I say "Camp Scarlet" that means there were three 3 year olds in my care, as opposed to the normal one or two). I was actually surprised at how much the children enjoyed this one. I mean, I thought they would have fun, but they were mesmerized. I got the idea from Family Fun. You take 4 bars of Ivory soap, or any white soap (we used 5), grate them (we used the grating plate in our food processor, but you could easily do it by hand as well), add ~1/2 c. warm water (we used 3/4 c), and mix until it's squishy. Then you take a handful, shape it into a ball, poke a hole in the ball and put a little plastic toy in there (we used little plastic squirting toys that I found at a dollar store, because I could not find little plastic penguins, which I really wanted to use, anywhere), filling the hole back in to form a ball. Let them dry, then wash, wash, wash away, until the toy is revealed. Family Fun said their recipe made 8 soapy snowball surprises, but I think their toys must have been smaller, because we only made 9, with more soap, and some of our snowballs definitely could have used a bit more "snow" to round them out. My little charges couldn't wait to wash their hands with their new soap--then they spent a good 20 minutes playing with some leftover squirty toys in the bathtub. And I realized that I haven't updated you about my friend J. J's daughter, Car, is the third 3 year old who transforms our home into "Camp Scarlet" every other week. You may recall that in October, J was diagonosed with stage 2 breast cancer. She had 2 surgeries to remove all of the cancerous cells, and based on the genetic profile of the cancer, she was scheduled to have 6 weeks of radiation treatments. I guess I never really thought about it, but when someone is being treated for cancer with radiation, she is required to go in 5 days a week for the treatments--so it was a huge disruption to J's life and her family's schedule. Her last treatment was last week, and she's doing well--relieved to be done. Thank you so much for your prayers and concern for J over these last few months. I enjoy kicking chunks. You know what I mean...that build-up of ice and dirt that collects on vehicles, usually on the fenders behind the tires... I like kicking those off. It's just so satisfying to me. I don't know why. Bubby has picked up on the practice now. We've been having optimal chunk-forming conditions around here: just the right amount of slush, just the right amount of cold, to form some really rewarding chunks. When we're out and about, each time we get out of our big ol' 'burban, Bubby walks around it looking for chunks to kick. I personally like to wait until the chunks have reached a nice big conical shape before kicking them, but Bubby will kick any little build-up he finds. All this chunk kicking (and really, if you've never tried it, you should--it's strangely gratifying--just be careful not to kick the really solidly frozen ones) has brought up an interesting question of etiquette: is it OK to kick chunks off of other people's vehicles? Although I'm pretty sure that Emily Post has never addressed this issue, I'm thinking the answer is probably, "not so much," but I really, really would like it to be "sure! go for it!" Because sometimes there are some really delicious chunks on other people's vehicles, just there for the kicking. And with Bubby kicking the chunks off of the vehicle I primarily drive, I'm just not getting enough of a fix. I did it today. I kicked someone else's chunk, first carefully looking around to be sure no one was looking. I felt like some kind of criminal, even though I was doing that driver a favor, and it was obvious that she wasn't interested in kicking chunks herself or this one would have been gone--it was so large it was impeding movement of the wheel. Maybe I can save the world, one chunk at a time. I'll be Super Chunk Kicking Woman and wear a glittery silver cape and a black mask with purple sequins. Ah, if only Ms. Post were around to advise me on this matter... What do you think, friends? I tried this recipe, from Pillsbury's 2011 calendar, yesterday, and thought it was delicious. 1. Brown and drain ground beef. Add taco seasoning, water, and 1/2 c. salsa and cook until thickened. 2. Press each biscuit into 6-inch round. Fill each with 1/8 of the meat mixture and 1 T cheese. Fold dough over filling and press to seal (I used a fork). Place on greased cookie sheet. 3. Bake at 375 degrees for 9-14 minutes or until golden brown. Serve with remaining salsa, cheese, and sour cream. This was one of those rare recipes that everyone liked. Well, Logo thought he wouldn't like it, so he didn't try it last night, but he did say he liked it when he had it for breakfast this morning. I mean, really, what's not to like? It's tacos and biscuits, two of his favorite things. Last night as I was folding and sealing the dough, I wondered aloud if this recipe would freeze well, and I told myself that it probably would, seeing as how chicken bundles, made with Pillsbury cresent rolls, freeze well. But as I was pondering, I thought to myself, hmmm, I wonder if I should bake it first, or just freeze as is. Our freezer is pretty well stocked with ready-to-go meals right now, but I'm always on the lookout for new recipes to make and freeze. Anyway, that's all very well and good, but here's where we cross over into why-did-I-not-think-of-this-before territory. First, you could put anything inside those biscuits. You could put pizza toppings inside, and make mini-calzone, (and you could serve them with pizza or spaghetti sauce for dipping). You could put ham and cheese inside and make little ham-n-cheese pockets. Turkey, broccoli and swiss. Bacon and tomato. Shredded chicken, BBQ sauce, and pepper jack cheese. Really, anything you can think of, you can put inside those little biscuits. And second, if I put them together, bake them, let them cool completely, then wrap and freeze them, I have made home-made hot pockets for a fraction of the cost--perfect for lunches on the go. Seriously! Why have I not thought of this before?! It's clothing repair day here in the Bluefield household. I had hoped that today would be Walgreens-and-Target-for-free-stuff and Goodwill-for-half-price-toys-and-children's-clothing day, but Bubby convinced me that it would be better to just stay home today. It really didn't take too much effort--I like staying home. This morning I placed 17 patches on 12 pairs of pants, most of which had not been patched before, surprisingly enough, as well as repairing torn seams on a pair of PJ bottoms and a shirt (I was wondering where that shirt had gotten to...). As I have mentioned before, if I wasn't willing or able to patch our kids' pants, the children would most likely be naked, which would probably be frowned upon by teachers and other authority types. I also pulled a pair of size 24 mo jeans with a hole in the knee out of my repair pile. I'm not sure what I was thinking when I put them in the repair pile--it's been over a year since Bubby has worn that size.... Well, I was probably thinking that I should repair them and then donate them to our favorite clothing charity: God's Closet. I'm waiting for Hubby to come home and tell me it's OK to not fix them, to just throw them away. These jeans are fine--they just have one little hole in one little knee, which could be easily repaired--and I'm sure that there is someone out there who would love to have this little pair of jeans. Most people, though, would experience absolutely no angst about just tossing this torn garment in the trash. I think the thought process is something like, I don't need or want this any more, so I'll just throw it in this tidy receptacle, which will be picked up, within a week, by some people wearing reflective clothing and driving a big green truck, and then it will be out of my house and I won't have to think about it any more. I don't know where it goes; I don't know how my choices affect others, and I really. don't. care. We are living in an increasingly disposable society. I try my very best to be a good steward of my resources, and a big part of that is reducing the amount of trash I generate, reusing anything I can, and recycling anything that can't be reused. I feel so strongly about this that I consider it a moral imperative. The jeans are damaged, but fixable, and while I no longer have any use for them, there are plenty of people out there who would. It's not about being cheap (although I definitely do qualify on that count as well); it's about caring for other people and our world, as we've been charged to do by the One who made it all. *Sigh* Oh well, I guess it's back to the ironing board for me! Woowee, was that a cold shower this morning! I see a couple of pieces of 2x4, various fabric scraps, ribbon, a pipe cleaner, sequins, buttons, pom-poms, beads, and sticks. And what's that in the corner? Socks? What is going on here? We made these adorable little snowmen this morning. Aren't they cute? And we made them with things we found around the house. The BEST husband in the world cut a couple of 7" pieces of 2x4 for us, and drilled a 1/2" hole where we thought a nose would be. He also drilled a very long hole through the 3.5" width of the boards for the arms. I was kicking myself this morning, wishing that I had asked Sawblock to cut 3 boards so I could make a snowman, too, but then Bubby kindly allowed me to make a snowman using his board--wasn't that generous of him? We painted them white (which was really easy because these boards were white to begin with), gathered our supplies, and then got to work decorating. I forgot that I was going to have the kids sand their 2x4s to give the finished snowmen a bit of a weathered look. I think we were all just a little too eager to get started. The arms are dried grape vines; the noses are orange pipe cleaner, folded in half. Pal's scarf is a piece of ribbon, and mine is a piece of felt. The hats are baby socks with the foot portion cut off. Pal chose beads for her eyes and mouth, while I used buttons. Here's my guy in situ. He's such a fun little guy to look at and converse with while I'm washing dishes. We went to the Minnesota Science Museum on Monday--they have a program called "Playdate Monday," where children age 5 and under get in free with a paid adult (but children under the age of 5 get in free every day). There are make and takes, a special story time, and some short science-y presentations throughout the day. We had a fun time, but it really didn't seem any different from any of the other times I've gone to the museum. And it was a bummer because we missed the geometry playground exhibit by a day. They were dismantling it when we were there--it looked like it was really fun. The pendulum pen writer thingy was the kids' favorite, I think, that and the thing that shows how much blood is in your body. No pictures of those, because we were too busy playing to stop and pose. 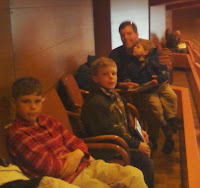 My three oldest boys went to Cub Scout Polar Camp on Saturday. They have such a talent for choosing the absolute coldest day to go. They had a great time, as always, and no moving violations this year (at least not that I've heard). This is Code-man digging in the snow. With a spoon. I don't know why. On a side note, and to further illustrate my obsession/mental illness/insanity, last night, knowing that I would be making a trip to Target today, and knowing further than my Hubby is currently suffering from a sore throat (as am I), and being in possession of Halls coupons, I asked my Hubby if he needed any more sore throat drops. He replied in the affirmative. So far, pretty normal, right? Then I said, "how soon do you need them? I can get them tomorrow, but they'll cost 22 cents, are you sure you want me to pay 22 cents for them, because if we wait, I'm sure we can get them for free. In fact, I can get Vicks throat drops for free at Walgreens tomorrow. Would you like to try those?" My husband chuckled and told me that paying 22 cents would be OK, and that he would even be willing to pay $3 for them (gasp), if he needed them (well, now that brings up a whole 'nother story about needs versus wants, because Hubby, you don't really need cough drops. You would survive without them, albeit more uncomfortably, and we do still have the Vicks drops, which were free). Can you imagine? Three whole dollars for something that I was able to get for 22 cents. That is more than 12 times what I paid. This, my friends, is why I am our household's procurement manager (even though I'm not so sure it's good for my mental health). Hey there, all you digital frame owners! Do you have trouble remembering to update the pictures in your digital frame? Well, join my all-new Digital Frame Club, by sending me an email with "Digital Frame Club" in the subject line, and I'll send you timely reminders to change your pictures 4 times a year, or whenever I remember to remind you. How's that for an offer?! And we can get started right now...time to update those pictures! We are celebrating snow this week at our house! Of course we've been playing in the snow every day. Today Bubby was plowing the driveway with his 'dozer while we were waiting for the bus (as he does every day), and our neighbor asked if we could send him over to do hers. He actually does a pretty good job of clearing the snow, but with only an 8" blade it takes a loooooong time. On Wednesday we made snowflake votive holders--I'm so pleased with how they turned out. I love the way the light flickers through the tissue paper, highlighting the snowflakes. Last night as I was preparing today's craft, which was inspired by Valerie of Frugal Family Fun Blog, I commented to my Hubby that this one was going to be frame-worthy. It's beautiful, and really, it's so easy, even a 19 and 3/4 month-old could do it. I'm so excited to frame and hang this one in our basement gallery. First, I used masking tape to make a basic snowflake shape on canvas paper (I used Artist's Loft fundamentals Acrylic Pad ($4.99 for 20 sheets at Michaels, minus 40% off coupon equals just 15 cents a page), but you could use any paper that would allow the masking tape to be removed without ripping the paper). I think if I were to do this again I would cut the tape on an angle so that the tips of the snowflake come to a point. I taped newspaper to the table to protect it and taped the canvas paper to the newspaper (using loops of tape on the back, so as not to block off any of the front), to keep it from moving around. Next, I invited the children over to paint (actually, they were already hanging around anxious to get started, so I really didn't need to "invite" them)--they used 1" foam brushes to cover the entire surface with purple, 2 shades of blue, and sparkly blue paint. They did not, for some reason, use their fingers this time. After the paint had dried completely, I peeled off the masking tape to reveal a white snowflake beneath. Next, I outlined the snowflake with a sharpie. Aren't they beautiful? Definitely frame-worthy. Now, I know I saw a 12x9" frame somewhere recently! Mix 3 cups clean, loose snow, 2 T milk, 1/4 c sugar, and 1 t vanilla, and enjoy immediately. And they're even all looking at the camera.